Domhnall Heron flies the Leitrim flag after reaching the summit of Mount Elbrus. 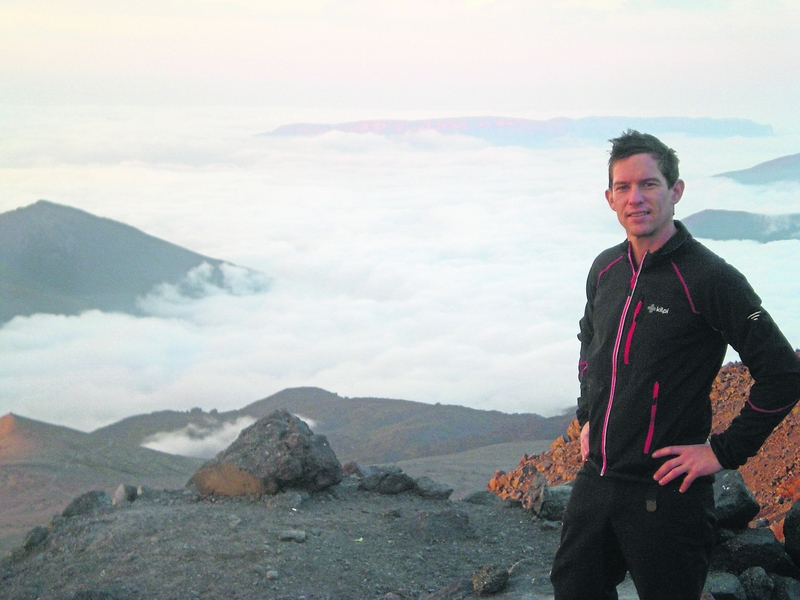 Domhnall Heron, from Drumshanbo recently climbed Europe's highest mountain, Mt. Elbrus. The time is now 11am. We have been ascending since 2am: 9 hours through the dark and dawn to the saddle between the Eastern and Western summits of Mt. Elbrus. Snow has been falling at our camp below since 9am but has not reached us yet. Dark clouds are rising. We are progressively enveloped in a white mist, the vanguard of the storm. Visibility is decreasing. Is it safe to continue towards the summit or do we make a hasty retreat to our camp? At 5642m Mt. Elbrus is the highest mountain in Europe. Situated in the Northern Caucasus Mountains in Russia why Elbrus is considered European is a question for another day. Elbrus is 5 1/2 times the size of Carrauntoohil and some 1000m taller than Mt. Blanc in the French Alps.A Dublin-based company called Earth's Edge offers Irish enthusiasts the opportunity of climbing this peak. On this expedition thirteen make the attempt. All four provinces are represented. We have electricians from Newry and Castlewellan in Co. Down and a truck driver from Wicklow. Four represent Cork including twins from Mayfield, a telecommunications engineer from Charleville and our mountain guide, John Healy. From Tipperary there is a second telecommunications engineer and a primary school teacher, a navy officer from Waterford and a Welch analytical chemist based in Clare. The lone lady is an accountant from Limerick who is well familiar with Leitrim having worked with the Credit Unions around the county. From Drumshanbo, I'm the doctor for the trip. After flying from Dublin to Moscow to Pyatigorsk in the Southwest of Russia our journey begins with a four hour bus journey to Elbrus Base Camp. The last hour is over steep dirt roads barely passable in a 4x4. At 2,200m Elbrus base camp is nestled well below the snow line. Our first day of hiking involves carrying the heavier portion of our gear to Camp One at 3,750m. We then return to Base Camp to spend the night at the lower altitude to allow our bodies recover better. This 'climb high, sleep low' method will be repeated over the next week to maximise the body's potential to acclimatise to the high altitude and reduce the risk of Acute Mountain Sickness (AMS). AMS becomes an issue over around 2,500m. Our first day of hiking from Base Camp takes us up 1,500m vertically over 6.5km. The terrain is steep and rocky. We carry 15-20kg in our backpacks so the effort required is considerable. I'm on the lookout for people struggling with shortness of breath, headache, nausea or with the pace. Generally the group is very strong and moving well. At Camp One we deposit our gear, take some light refreshments and return to the relatively thick air of Base Camp to recover. We have taken 41/2 hours to ascend and 2 hours to descend. Overall 61/2 hours is a solid workout for Day 1. For Day 2 we retrace our steps back to Camp One bringing the remainder of our gear with us. The bags are lighter today as we carry around 10-12Kg. The well-worn path from Base Camp leads up the side of the V-shaped valley carved out over millennia by the river of glacial melt water below. At the top is a small plateau that gives the legs respite from climbing for the 20 minutes or so it takes to cross. At the far side the angle of slope shoots upwards as we climb up the lateral moraine with the view of the white glacier below and to our right. The lateral moraine is a high bank of rock and rubble pushed aside by the glacier many years ago as it moved down the valley. Like most glaciers, this one is smaller now due to global warming. When once it was larger extending sideways to the high rubble below our feet, now it is several hundred metres away in the distance. On reaching Camp One for the second time we are introduced to our lodgings for the next five nights. With thirteen people squeezed into a circular, beehive-shaped, wooden dwelling of 5m diameter conditions are cosy to say the least. We sleep on half inch foam mats on plywood flooring. There are two levels: nine lads sleep on the bottom divided into three sleeping in each of three partitions. Three more lads, including myself, sleep on the upper deck. The lack of guard rails makes me hope I don’t roll around in my sleep. The 5ft drop would be a rude awakening. There is a coffin-like single sleeping space for the lucky Limerick lady in the group. However, Diamox does come with side effects. Tingling of the hands, feet and lips are common but Diamox is also a diuretic: it increases urination and can cause dehydration. To keep the body at optimum hydration we aim to consume 3-4 litres of water per day. An added complication is that our water source is from a glacier. Unlike bottled or tap water, glacial melt water contains no minerals. Dioralyte is added to prevent minerals like sodium and potassium being washed out of the body. Day 3 brings a relaxed and fun itinerary. Today is our first day on snow and ice. We take things easy but learn some valuable skills for the days ahead. We put on our double boots for the first time on this expedition. Double boots are essential to protect the feet from the cold during high altitude climbs. These boots have an inner, insulated, above ankle slipper that fits inside the rigid outer boot. The outer boot is made from thick plastic or a synthetic material. To the soles we attach 12 point crampons. These spikes provide grip on the steep slopes of hard, compact snow and ice. They take some practice getting used to them and trusting they will hold firm. The type of ice axe we use is not for climbing but rather for stopping our slide should we fall down the slippery ice: the so called ice axe arrest. Several times we deliberately set off sliding down the icy hill at speed to practice flipping over onto our stomach and jamming the ice axe into the ice to arrest our fall. Wearing a climbing harness we practice moving up and down a rope while passing people coming in the opposite direction. This mimics the fixed ropes and human traffic we will encounter in two days’ time near the summit. In the corrugated iron, cylinder-shaped canteen at Camp One we swap stories about trips we have been on. Our Irish guide, John Healy, is by far the most experienced having summited Mt. 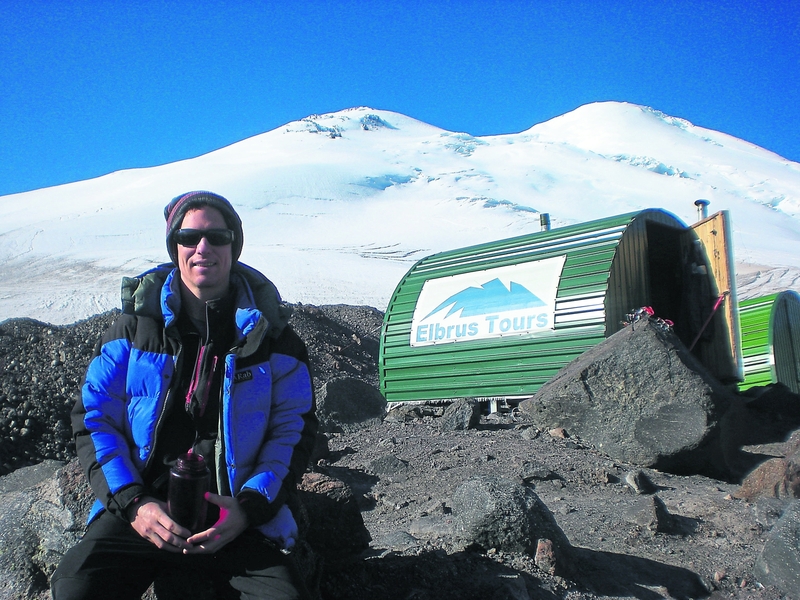 Kilimanjaro seven times as well as Denali in Alaska and multiple peaks in the French and Swiss Alps. The food is delicious. Various soups filled with a multitude of vegetables and meats are eagerly devoured. There is bread, cheese, cold meats, tea, coffee, green tea and hot chocolate. Breakfast is a particular favourite. Simple but tasty there are lashings of porridge sweetened with local honey, enhanced with flaked nuts, seeds and raisins. Accompanied with fried egg toast it sets us up nicely for the day. It is fine cuisine for 3,750m above sea level. Earth's Edge has also hired a local Russian mountain guide who has been with us since we arrived in Moscow. A balding man with grey moustache in his mid-fifties with limited English he doesn't say very much. His intense but friendly eyes, calm commanding presence and sure-footedness on the mountain hint at a kind of elder statesman with great experience. Viktor Volodin is no ordinary guide but a colossus within Russian climbing. Day 4 is a step up in intensity and is our first big day on the snow and ice. The plan is to ascend almost a vertical kilometre to a place called Lentz Rocks at 4,650m. This will give us a real impression of the effort required to reach the summit. We depart Camp One at 9am. The pace is brisk and the weather warm. Two people develop painful-looking blisters that need some patching up with Compeed. Though vital for protection from the cold we are learning that the double boots can be unforgiving too. After 4 1/2 hours we reach Lentz Rocks. It is harder to catch a breath up here but people are doing well. On the descent, the warm midday sun has created much slush and many melt water streams in the glacier. Crevasses have opened and snow bridges are not to be trusted. The area is much more unstable than when we passed this way earlier in the morning. We split into two groups and rope up. After a 6 1/2 hour day we arrive back at Camp One tired but happy. Blisters are the main side effect of the day. Some people have quite large skin breaks. My left lower shin has been cut. The treatment is the same for us all: clean the area as best we can with sterile wipes, remove any dead skin, apply Compeed and see how we feel tomorrow. Day 5 is a complete rest day though we will set out for the summit at 2am, weather permitting. It is difficult to sleep during the day but important to lie down as sleepless rest is better than constant activity. People make last minute alterations to boots by cutting up some foam matting to place under heels to reduce heel movement. There is a yoga session on the decking outside the canteen. At 3,750m under the shadow of Europe's highest peak the synchronized movement and poses of seven grown Irishmen makes for an interesting sight. Darkness has fallen by 7pm and dinnertime when we are introduced to a second Russian guide and third in total who will accompany us tonight. A third guide increases safety on summit night and maximizes our chances of success. Should someone be unable to continue and require a guide to descend with we would still have two guides for our large group. Andrey Fetisov is yet another impressively interesting Russian mountain guide and polymath. He is part of a Russian project that drilled through the Antarctic ice sheet to a 15 million year old lake in search of primordial biological particles. 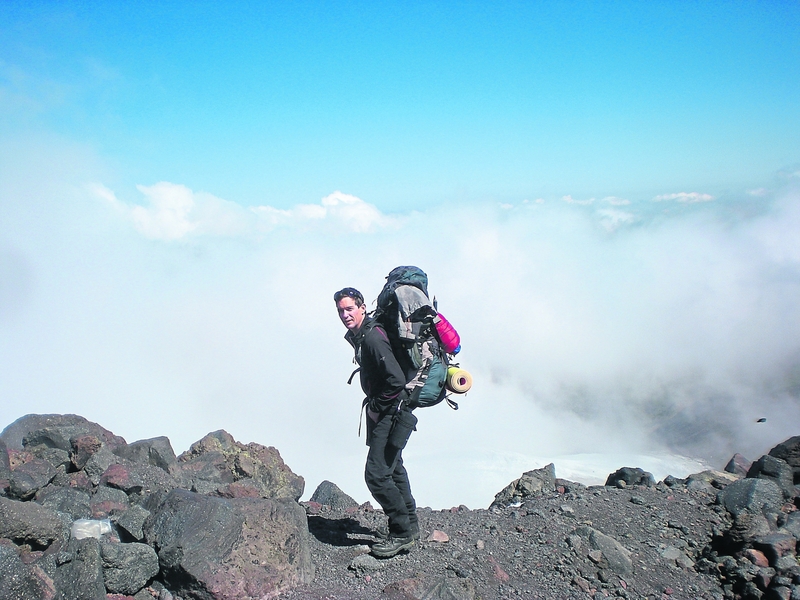 In his forties he spent four years studying Japanese culture and language and he has climbed Mt. Elbrus over 100 times. After cordial hellos and handshakes with Andrey we return to our beehive hut for sleep around 8pm. At midnight there is rustling all around with the darkness pierced by light from head torches. Our beehive hut is suddenly a hive of activity. Sounds of unrolling of duct tape, opening of Compeed packages, the fizz of electrolyte tablets dropped into water and rustling of layers of clothing been added mark the last preparations before the final, long push we've been waiting months for. We eat what little we can at this time of morning. The wind has picked up significantly but our guides confirm we will make the attempt. We set off at 2am sharp. Once more we cross the tricky rough rocks that lead to the edge of the glacier. By torchlight we attach our crampons and split into three rope teams. We don't want anyone falling into a crevasse in the darkness. Progress is swift and we pass the dangerous part in what seems like no time at all. We un-rope and continue upwards. I'm feeling good. My movement is smooth, my feet comfortable. Our procession by torchlight continues upwards at a fine pace as the darkness turns to grey then a deep blue band forms on the horizon along the curvature of the earth turning to deep red until the sun blazes through the Eastern sky behind us to our left. We take a short break below Lentz Rocks and swap head torches for ski goggles. Soon we are past out previous high point and turning to the right towards the col (or saddle) between the Eastern and Western summits. The distance looks small though the ascent to the saddle seems to go on forever. In truth it takes nearly five hours since turning right near Lentz Rocks but half an hour before we get there we are aware the weather is changing. John lets us know that we will decide on the saddle whether it is safe to go any further. We finally arrive at 11am. Snow has been falling heavily at Camp One since 9am. We have been above the clouds so far but the white mist is gaining on us. As we reach the saddle visibility has reduced to metres. We decide it is still safe. Viktor pushes on with five people who have volunteered to move at a quicker pace. As they disappear into the whiteness John and I follow with four others at a slower pace. Suddenly, as the cloud lifts, Viktor's group is out of sight but we see the fixed ropes 300m in the distance. We are now on a steep, hard, icy slope with rocks below. This is tricky terrain and dangerous if someone slips. As I am 5m from the ropes I look around and someone does slip. The scene unfolds in slow motion before my eyes. He is on his back sliding and out of control. He flips onto his front and bangs the thin end of his ice axe into the ice. It sticks. His shoulders jolt with the sudden deceleration but he has the upper body strength to hold on. Quickly he is helped to his feet and everyone reaches the ropes to clip in. Once clipped to the fixed ropes movement is much safer. The group fans out ahead of me. The sky is bright. I know we will make the top. My pace slows to make sure I'm not out of breath and to conserve energy. The descent could be long and treacherous. I meet the faster group of five on their descent. We congratulate then I move on over the narrow ledge and up the final 20m to the Western summit of Mt. Elbrus. The time is 12.15pm on 18/8/18. It has taken just over ten hours to ascend the 1,950m of altitude over 8km from Camp One. Various flags are flown and I make sure to get a picture with the Leitrim flag I have brought along for the occasion. We don’t spend too much time before descending to our friends waiting at the saddle. Snow is falling heavily now with visibility down to less than 100m. Thunder echoes through the mountain. It seems far away at first until we hear one loud clap nearly overhead. 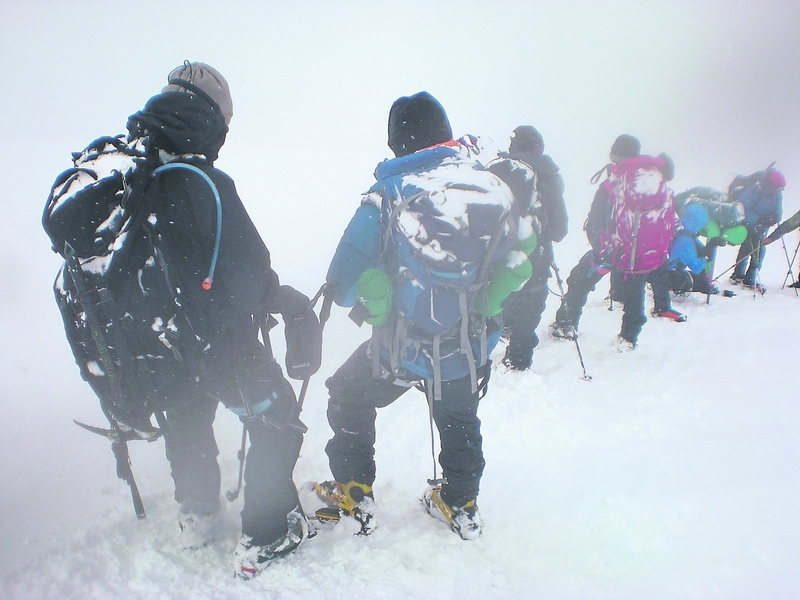 Three people died on the mountain in a single day last month in similar conditions. The experienced Viktor leads the charge and we descend at speed. One of the members alerts me that another is swaying and stumbling. As I catch him we take a knee for a minute. He is a little tired and hypoglycaemic but nothing some water and a good dose of sugar won't fix. We call out to those below but they neither see nor hear us. Five of us have become separated from the group. To our right we see the rocks leading to Lentz Rocks so continue to descend using them as our guide in the near white-out conditions. Eventually we make radio contact. The others have noticed us missing and have waited a mere 300m below. However, we don't see each other until we are practically side by side. When together again the guides reinforce the importance of getting off the mountain quickly so we push on avoiding breaks. At the crevasses, which appear to have doubled in size, we rope up one final time. It is 4.30pm when we arrive having taken just over three hours to descend. Camp One is barely recognizable under a thick blanket of snow. After some food and prosecco we retire for an early night. Next day, Day 7, we carry heavy packs weighing up to 30kg back to Base Camp. This is our last hike of the trip bringing to an end a thoroughly enjoyable expedition. Here we treat ourselves to a nice warm shower and a few celebratory beers while listening to the All-Ireland Hurling Final on the radio.